Parents searching for quick healthy breakfasts for their kids need look no further. 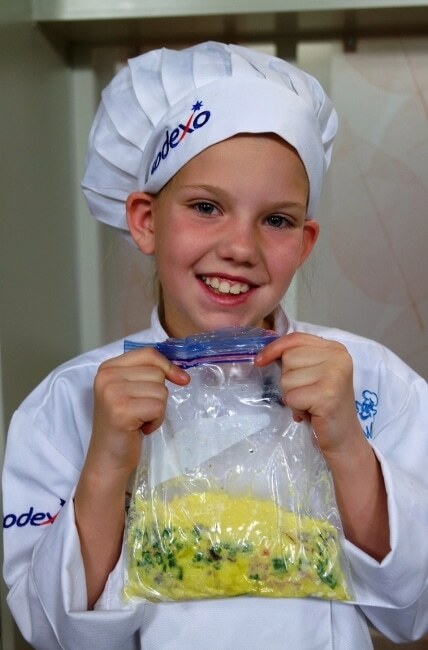 Fourth-grader Madysun Christensen of Salt Lake City, UT, has the winning recipe in Sodexo’s 2016 Future Chefs: Healthy Breakfast Challenge. Madysun, with her Boil-in-a-Bag Omelet recipe, is the national winner of the annual contest, held by Sodexo, global Fortune 500 company that delivers sustainable, integrated facilities management and foodservice operations. Sodexo invited elementary school students in Sodexo-served school districts across the United States to create breakfast options that kids will enjoy. Out of nearly 2,500 entries, Madysun was one of five finalists selected to create videos of their recipes, and the public was asked to vote for their favorite. The engaging recipe videos from the 2016 finalists secured more than 167,000 votes this year—a record-breaking number, which is triple the vote count from 2015. Madysun will receive a celebratory event at her school and more than $2,000 worth of prizes. Now in its sixth year, the Sodexo Future Chefs program encourages better eating by actively involving students in good nutrition. Students participating in the program represent 1,300 Sodexo-served elementary schools in 230 school districts and 28 states. This entry was posted in Recipes, Videos and tagged breakfast, egg, Madysun Christensen, recipe. Bookmark the permalink.